The talent section of our guides show you all viable builds. We do this with data, not opinion. As you probably already wondered, what do we mean by viable? To one person, viable might mean anything within 1%, but to someone else it might mean 10%. My personal opinion is anything within 3% is fine, but that won’t be the same for you. When surveyed, 19% think no tradeoff is acceptable (not even 0.25%) while 23% players think a 10% (or more) DPS loss is perfectly fine. Instead of making the judgement call on your behalf, we let you customize these percentages. Then you can see how many top builds each talent falls into, and play with the system until you find a build you like or want to experiment with. This 1-minute video gives you a quick overview. It has captions for those of you not able to play sound right now. UPDATE: The bars for each talent USED to represent the number of top builds they were in (like the video shows). They NOW represent the actual damage, which is much better. I will have an updated video soon. Rotations can be hard to learn and even harder to master. 1 in 3 players report their rotation as the biggest thing holding back their performance. Rotations aren’t really a sequence that you repeat, they are more of a priority list with decision points. You know what helps visualize something like that? Flow charts. We hope our unique layout can make mastering your rotation easier. 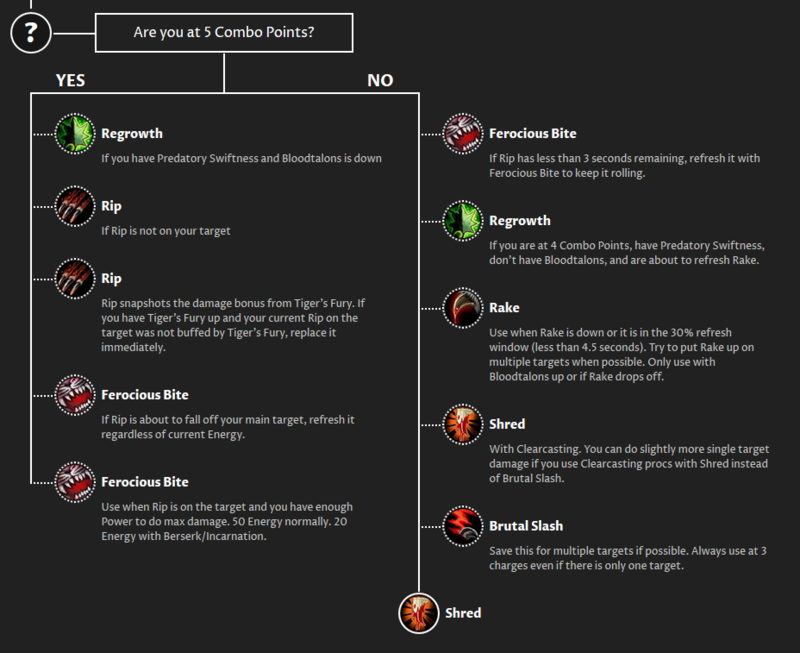 Here an example flow chart excerpt from the Feral Druid guide. Rotations are complicated, and it’s hard to know when a piece of logic will increase your DPS (and by how much). The Rotation Analysis section of these guides will answer those questions. Should you pool Maelstrom before Stormkeeper so that both Lightning Bolts can benefit from Surge of Power? DPS Delta: This shows you the DPS gain (or loss) from the test. In this example, pooling Maelstrom before Stormkeeper results in an average DPS gain of 0.67%. The max from a specific set of gear and talents was 1.84%, and the worst gear setup lost 0.42% DPS. This information lets you decide if a piece of rotation logic is worth it for you. Top Tier Setups: Each test is run across a variety of talent + gear setups, but it is useful to have some statistics on only the top setups. In this example, 85% of the top setups saw a DPS gain and 15% saw no change from this test. All Setups: This section shows the percentage of talent + gear setups that saw a DPS gain, loss, or no gain. You can see that 0.15% of the setups lost DPS. Not all tests result in DPS gains and we share those too. In this example, the Top Tier setups column shows that 20% of the talent + gear setups did result in a DPS gain. The average was 0.04% but some setups got as much as 1.95%. However, you can also see that 60% of the Top Tier setups were worse, up to almost a 2% loss. This data also demonstrates that one rotation doesn’t ‘rule them all’ – there are a lot of ways to play that work well across various setups. We currently have the rotation analysis for Elemental Shamans posted up. The rest of the specs are being worked on and we’ll be adding more analysis day after day. Our guides are based on a lot of theoretical data. I say theoretical because a simulator is a model of the game, not the game itself. So we take one last step with our guides and compare them to logs of top players. When the two sources match, we know our advice is realistic. We don’t just compare the most popular builds to logs, we look at ‘off-meta’ ones as well. We keep an eye out for top-ranked logs that use less popular builds and share the the log-comparison with you in case you want to try it out too. What if the guides say something different than what’s out there? They definitely will. That’s half the point of our guides: we’re offering a lot of choices that you won’t find elsewhere. It’s up to you to decide which of the choices are best for you. Our simulator is based on realistic boss fights with things like movement (which can change how you cast spells and our rotations account for this). Our rotations are tested against top logs, to verify they can actually be executed (and not too ‘robotic’ or impossible). We currently compare these to top Heroic Grong logs with our Grong simulation script. We optimize for all talent builds, not just the most popular one(s). This means you will sometimes see ‘bad’ builds be much closer to the ‘best’ builds on our site & simulator because we spent time optimizing even ‘bad’ builds them to give them a fair shake. It’s okay if we say something different. It’s healthy. It’s good for the community. It challenges the status quo and makes adopting new things possible. Forcing one ‘right way to play’ on people makes it hard for each person to figure out what works best for themselves. It also leeches fun out of the game. I can confidently tell you this: if you make choices based on the data in our guides, you will perform well. If you follow advice from other guides, you’ll also perform well. You don’t have to pledge loyalty to one source. Read them all and pick what works best for you. This is the first iteration and we want to know how you like them – check the guides out here. What do you love? What do you want to see added? Do you have any specific questions we can answer with our rotation comparisons? Post feedback on our forums.